Are We Seeing the Decline of the Formal Living Room? - Dunbar Builders, Inc. Remember the days of “take your shoes off in the living room, and don’t put your feet on the nice furniture?” You might even recall a plastic covering on your grandma's chintz sofa reminding you that the living room, and its contents, was a “special room.” Fast forward to the days of our parents - the living room became the room we rarely spent time in, the room reserved for family meetings, or perhaps book club. Presently, if a formal living room exists in a home, homeowners often show it to their guests and say, “this is our living room; we are never in here.” This brings us to a highly relevant topic in home construction: are we seeing the decline of the formal living room? Dunbar Builders has many clients who ask us to build their home without a formal living room, and you have probably already noticed this room seems to be on the decline in most homes, especially in new construction. 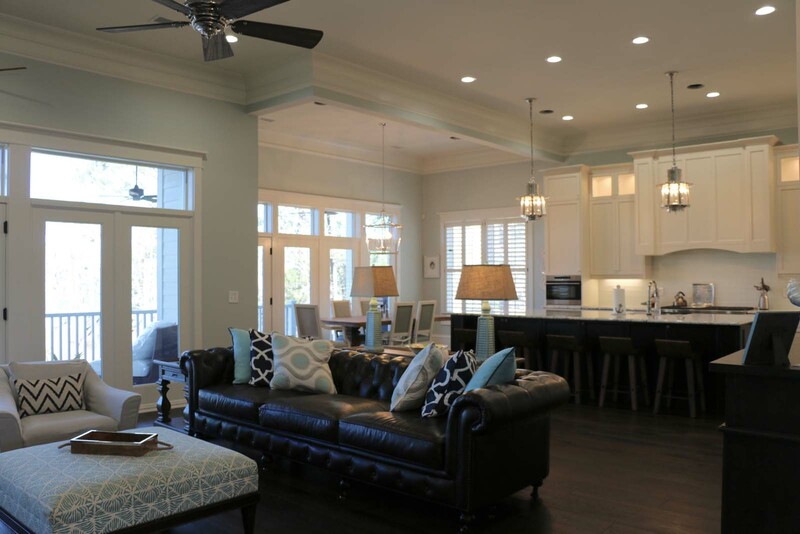 Dunbar Builders always ask our clients the top things they want in a home, and rarely does a living room make the cut. Why, you ask? The homes we build are often centered around the concept of an open layout, and larger rooms instead of smaller, choppy rooms. With the passing of time, design tastes have changed, and with them, out went the formal living room. Open concepts provide a more practical layout for families, which is why Dunbar Builders often excludes this room from our plans altogether. Gone are the days of formal entertaining in the living room. We simply don’t have the time, nor do we have the desire. Instead of inviting guests into the special, delicate, formal, reserved-for-special-occasions room, we invite them into the heart of our home, the kitchen and the family room. Asking for a home office to be incorporated into the plans is a top request we get at Dunbar Builders. With the continued growth of technology and the move toward global and vertical markets, more and more of our clients are working from home, and therefore need a functional home office, not a living room that’s never used. Not only is the amount space in a home important, but how the space will be used has become increasingly more important! Voila! Your formal living room will no longer be dead space. It will become a space you use and enjoy. It will become a room you actually spend time in - the way it should be! Stone In and Around Your Home – Cultured or Natural? Why gold fixtures and hardware are back in style. Did they ever go out in the first place? What should you look for in a residential custom builder? Selecting blinds for your home – real and faux wood blinds are both great choices! Add character to your porch with a joggling board! Why Paint Your Porch Ceiling Blue?